This year Sinn has decided to launch a watch based on classic Beobachtungs-uhr (B-Uhr) fliegers. However, rather than using a traditional B-Uhr type 55mm case size, this new limited edition model is the same far more wearable 40mm sized case as the other 856s and contains the automatic Sellita Calibre SW300-1. The B-Uhr is in an edition of 856 pieces (as per the name) and features some Sinn classics like the 1200 Vickers tegimented case, AR-dehumidifying technology, antimagnetic properties, and 200m of water resistance. Within the case, you also have anti-magnetic shielding, protecting the movement up to 80,000 A/m. A matte black dial forms the background for a dial that is a little bit old and a little bit new. 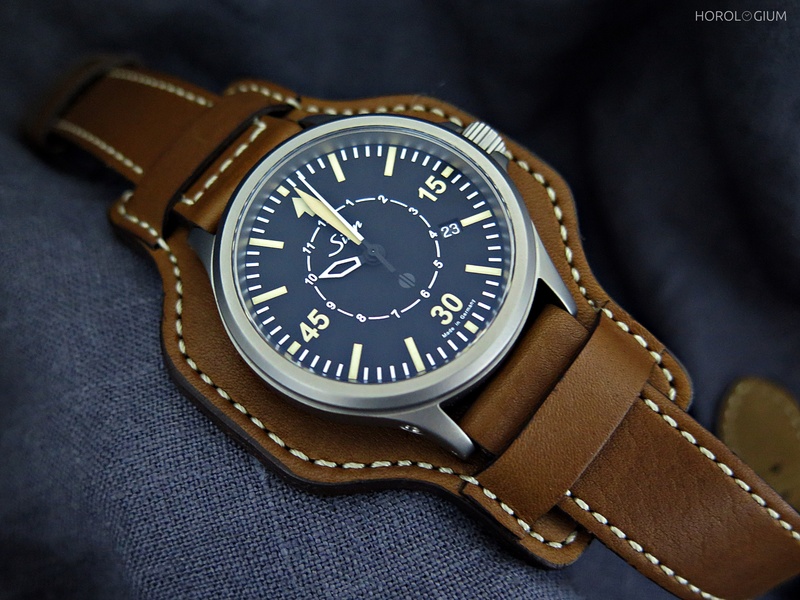 One thing familiar to those who know their Type A and Type B flieger dials is the shortend sword-shaped hand pointing to the hour in the inner ring. The outer one is a minute index with numerals at 15, 30 and 45, triangle at 0/ 60, and small markers for the individual minutes. One immediate difference between the Sinn B-Uhr and a standard B-Uhr design is that Sinn went with numerals purely at the quarter hours; this may be something that may appeal to some but not so much to others. There is also another addiction which is aimed at more modern tastes rather than traditional fliegers – the date window at 4 o’clock. It is is the same location and style as per the other 856s, and is fairly discreet because of the use of white on black, but again, the presence of a date window may be considered extraneous by those who like their vintage-inspired fligers to be as close to Types A and B as possible. A final thing to note is the use of two different lume colours. For the numerals and 5-minute marks, they went with a warm, parchment colour. For the individual minutes, they used white. The 856 B-Uhr is available with a leather bund strap (shown) or with a tegimented bracelet for an additional amount. The bund strap is more oriented to those of a historical bent. Made of tan leather with contrast stitching it’s attractive and comfortable, but I realise that not everyone is accustomed to such a strap, so you can simply take the padding bit off and wear it with the regular strap style, bearing in mind that because of the bund, the strap is longer than usual. Simplicity, functionality, durability. Key aspects of fliegers and key features of Sinn’s much loved tool watches. The Australian RRP is $2,475.00 incl. GST. A silicone strap is an additional $325 and a solid bracelet, also $325.